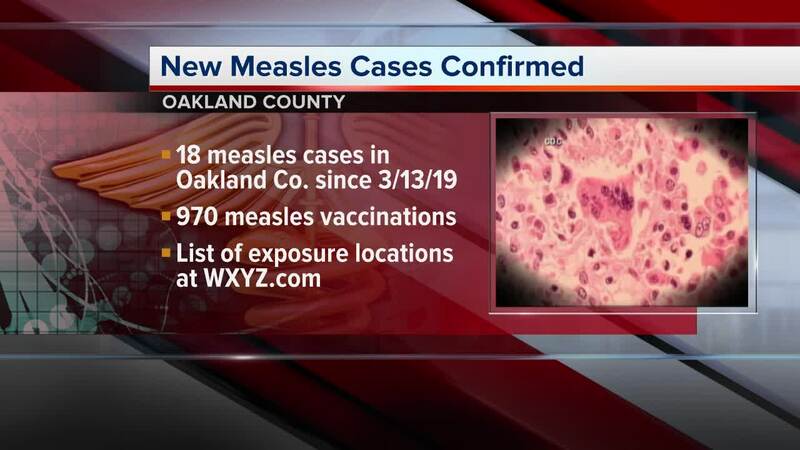 OAKLAND CO., Mich. (WXYZ) — Oakland County health officials now say they have confirmed 18 cases of measles in that county. This news comes more than a week after the Michigan Department of Health and Human Services and the Oakland County Health Division announced that there was a travel-related case of the measles, and several metro Detroit locations had possibly been exposed to the virus. Health officials will update www.oakgov.com/health as more cases are confirmed. Below is a list of locations potentially exposed to the measles virus. Kollel Institute of Greater Detroit: 15230 Lincoln St., Oak Park, 8:20 – 11:20 a.m.
Meijer: 5150 Coolidge Hwy., Royal Oak, 10:30 a.m. – 1:30 p.m.
Ohr HaTorah Synagogue: 15150 W. 10 Mile Rd, Oak Park, 7:00 – 11:00 p.m.
One Stop Kosher Food Market: 25155 Greenfield Rd., Southfield, Oak Park, Noon – 3:30 p.m.
Pointview Products: 46986 Liberty Dr., Wixom, 8:00 a.m. – 3:30 p.m.
Yeshiva Beth Yahuda: 15751 Lincoln Dr, Southfield,10:00 a.m. – 5:00 p.m.
Mapleview Liquor at 6084 W. Bloomfield Twp from 11:00 a.m. to 2:00 p.m.
Beaumont Hospital, Royal Oak – Emergency Department: 3601 W. 13 Mile Rd., 10:00 a.m. – 6:00 p.m.
Dovid ben Nuchim: 14800 Lincoln St, Oak Park, 8:30 – 11:30 p.m.